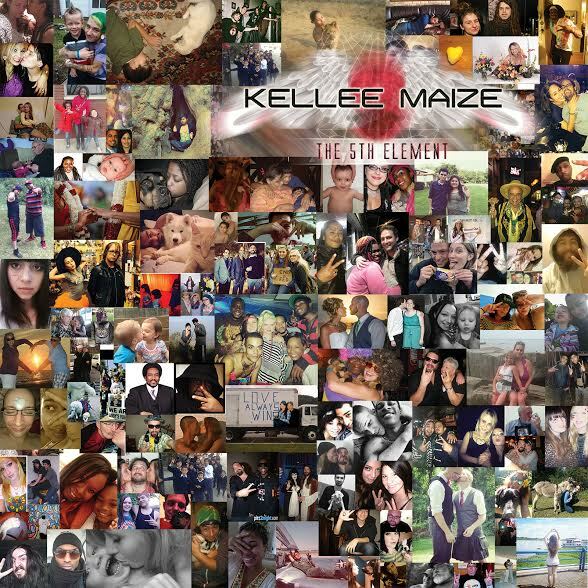 ‘The 5th Element’ is Kellee Maize‘s 5th studio album released for Valentine’s Day 2014, perfectly co-relating to the albums main theme. The 5th and missing element is Love – which in its unconditional form could help humanity evolve its consciousness from the “love of power to the power of love”, says Kellee Maize on her website quoting Jimi Hendrix. Kellee Maize’s thoughtful & inspiring lyrics and the underling message of love are the most prominent. If you’ve listened to any of her previous releases, like ‘Owl Time‘, ‘Integration‘ or ‘Aligned Archetype‘, you know spiritualism takes a very important part of her work. ‘The 5th Element’ is the slowest of all Kellee’s previous releases, with influences mainly from various types of electronic music. We even hear Kellee softer side singing as opposed to rapping in few of the tracks. Heavy southern style bass track ‘Dancing with Lightning’ opens the album just right. The second track, “Anyway”, is a lot more mainstream, flowy, almost poppy – very uplifting, in both the music and the lyrics. ‘Indo Amnesia’ definitely has heavy Southeast Asian influences, which interlaced with a slow hip hop beat produce a very hypnotic and almost a trance inducing track. In ‘I Know You’ Kellee experiments with reggae infused dub-step while ‘Rise’ comes filled with some serious 8-bit notes. “The 5th Element” is definitely one of Kellee’s most diverse albums that keeps its listeners engaged and interested through all 11 tracks. On the instrumentals Kellee collaborated with a friend Nice Nate, a young Polish producer Golden Day (a fan who initially just emailed her some beats), Pittsburgh DJ and producer Headphone Activist and New York based producer J. Glaze who mixed and mastered the album and produced the beats for the opening 2 tracks. The album cover design features over 1,000 fans that sent images depicting love in whatever way they saw it fit. It’s maybe not the most visually appealing of Kellee’s covers, but it stands a testament to the devotion of her fans and her love for creating a collaborative community. Love Kellee’s music and want to show your appreciation?